Computer hardware includes the physical, tangible parts or components of a computer, such as the cabinet, central processing unit, monitor, keyboard, computer data storage, graphics card, sound card, speakers and motherboard. By contrast, software is instructions that can be stored and run by hardware. Hardware is so-termed because it is "hard" or rigid with respect to changes or modifications; whereas software is "soft" because it is easy to update or change. Intermediate between software and hardware is "firmware", which is software that is strongly coupled to the particular hardware of a computer system and thus the most difficult to change but also among the most stable with respect to consistency of interface. The progression from levels of "hardness" to "softness" in computer systems parallels a progression of layers of abstraction in computing. Hardware is typically directed by the software to execute any command or instruction. A combination of hardware and software forms a usable computing system, although other systems exist with only hardware components. The template for all modern computers is the Von Neumann architecture, detailed in a 1945 paper by Hungarian mathematician John von Neumann. This describes a design architecture for an electronic digital computer with subdivisions of a processing unit consisting of an arithmetic logic unit and processor registers, a control unit containing an instruction register and program counter, a memory to store both data and instructions, external mass storage, and input and output mechanisms. The meaning of the term has evolved to mean a stored-program computer in which an instruction fetch and a data operation cannot occur at the same time because they share a common bus. This is referred to as the Von Neumann bottleneck and often limits the performance of the system. The personal computer, also known as the PC, is one of the most common types of computer due to its versatility and relatively low price. Laptops are generally very similar, although they may use lower-power or reduced size components, thus lower performance. The computer case encloses most of the components of the system. It provides mechanical support and protection for internal elements such as the motherboard, disk drives, and power supplies, and controls and directs the flow of cooling air over internal components. The case is also part of the system to control electromagnetic interference radiated by the computer, and protects internal parts from electrostatic discharge. Large tower cases provide extra internal space for multiple disk drives or other peripherals and usually stand on the floor, while desktop cases provide less expansion room. All-in-one style designs include a video display built into the same case. Portable and laptop computers require cases that provide impact protection for the unit. A current development in laptop computers is a detachable keyboard, which allows the system to be configured as a touch-screen tablet. Hobbyists may decorate the cases with colored lights, paint, or other features, in an activity called case modding. A power supply unit (PSU) converts alternating current (AC) electric power to low-voltage DC power for the internal components of the computer. Laptops are capable of running from a built-in battery, normally for a period of hours. The motherboard is the main component of a computer. It is a board with integrated circuitry that connects the other parts of the computer including the CPU, the RAM, the disk drives (CD, DVD, hard disk, or any others) as well as any peripherals connected via the ports or the expansion slots. The CPU (central processing unit), which performs most of the calculations which enable a computer to function, and is sometimes referred to as the brain of the computer. It is usually cooled by a heatsink and fan, or water-cooling system. Most newer CPUs include an on-die graphics processing unit (GPU). The clock speed of CPUs governs how fast it executes instructions, and is measured in GHz; typical values lie between 1 GHz and 5 GHz. Many modern computers have the option to overclock the CPU which enhances performance at the expense of greater thermal output and thus a need for improved cooling. The chipset, which includes the north bridge, mediates communication between the CPU and the other components of the system, including main memory; as well as south bridge, which is connected to the northbridge, and supports auxiliary interfaces and buses; and, finally, a Super I/O chip, connected through the southbridge, which supports the slowest and most legacy components like serial ports, hardware monitoring and fan control. Random-access memory (RAM), which stores the code and data that are being actively accessed by the CPU. For example, when a web browser is opened on the computer it takes up memory; this is stored in the RAM until the web browser is closed. RAM usually comes on DIMMs in the sizes 2GB, 4GB, and 8GB, but can be much larger. Read-only memory (ROM), which stores the BIOS that runs when the computer is powered on or otherwise begins execution, a process known as Bootstrapping, or "booting" or "booting up". The BIOS (Basic Input Output System) includes boot firmware and power management firmware. Newer motherboards use Unified Extensible Firmware Interface (UEFI) instead of BIOS. Buses that connect the CPU to various internal components and to expand cards for graphics and sound. The CMOS battery, which powers the memory for date and time in the BIOS chip. This battery is generally a watch battery. The video card (also known as the graphics card), which processes computer graphics. More powerful graphics cards are better suited to handle strenuous tasks, such as playing intensive video games. 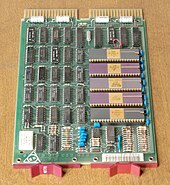 An expansion card in computing is a printed circuit board that can be inserted into an expansion slot of a computer motherboard or backplane to add functionality to a computer system via the expansion bus. Expansion cards can be used to obtain or expand on features not offered by the motherboard. A storage device is any computing hardware and digital media that is used for storing, porting and extracting data files and objects. It can hold and store information both temporarily and permanently, and can be internal or external to a computer, server or any similar computing device. Data storage is a core function and fundamental component of computers. Data is stored by a computer using a variety of media. Hard disk drives are found in virtually all older computers, due to their high capacity and low cost, but solid-state drives are faster and more power efficient, although currently more expensive than hard drives in terms of dollar per gigabyte, so are often found in personal computers built post-2007. Some systems may use a disk array controller for greater performance or reliability. To transfer data between computers, a USB flash drive or optical disc may be used. Their usefulness depends on being readable by other systems; the majority of machines have an optical disk drive, and virtually all have at least one USB port. Input and output devices are typically housed externally to the main computer chassis. The following are either standard or very common to many computer systems. Input devices allow the user to enter information into the system, or control its operation. Most personal computers have a mouse and keyboard, but laptop systems typically use a touchpad instead of a mouse. Other input devices include webcams, microphones, joysticks, and image scanners. Output devices display information in a human readable form. Such devices could include printers, speakers, monitors or a Braille embosser. A mainframe computer is a much larger computer that typically fills a room and may cost many hundreds or thousands of times as much as a personal computer. They are designed to perform large numbers of calculations for governments and large enterprises. In the 1960s and 1970s, more and more departments started to use cheaper and dedicated systems for specific purposes like process control and laboratory automation. A supercomputer is superficially similar to a mainframe, but is instead intended for extremely demanding computational tasks. As of June 2018, the fastest supercomputer on the TOP500supercomputer list is the Summit, in the United States, with a LINPACK benchmarkscore of 122.3 PFLOPS, exceeding the previous record holder, Sunway TaihuLight, by around 29 PFLOPS. The term supercomputer does not refer to a specific technology. Rather it indicates the fastest computations available at any given time. In mid 2011, the fastest supercomputers boasted speeds exceeding one petaflop, or 1 quadrillion (10^15 or 1,000 trillion) floating point operations per second. Supercomputers are fast but extremely costly, so they are generally used by large organizations to execute computationally demanding tasks involving large data sets. Supercomputers typically run military and scientific applications. Although costly, they are also being used for commercial applications where huge amounts of data must be analyzed. For example, large banks employ supercomputers to calculate the risks and returns of various investment strategies, and healthcare organizations use them to analyze giant databases of patient data to determine optimal treatments for various diseases and problems incurring to the country. When using computer hardware, an upgrade means adding new hardware to a computer that improves its performance, adds capacity or new features. For example, a user could perform a hardware upgrade to replace the hard drive with a SSD to get a boost in performance or increase the amount of files that may be stored. Also, the user could increase the RAM so the computer may run more smoothly. The user could add a USB 3.0 expansion card in order to fully use USB 3.0 devices, or could upgrade the GPU for extra rendering power. Performing such hardware upgrades may be necessary for older computers to meet a programs' system requirements. For the third consecutive year, U.S. business-to-business channel sales (sales through distributors and commercial resellers) increased, ending up in 2013 at nearly 6 percent at $61.7 billion. The growth was the fastest sales increase since the end of the recession. Sales growth accelerated in the second half of the year peaking in fourth quarter with a 6.9 percent increase over the fourth quarter of 2012. Because computer parts contain hazardous materials, there is a growing movement to recycle old and outdated parts. Computer hardware contain dangerous chemicals such as: lead, mercury, nickel, and cadmium. According to the EPA these e-wastes have a harmful effect on the environment unless they are disposed of properly. Making hardware requires energy, and recycling parts will reduce air pollution, water pollution, as well as greenhouse gas emissions. Disposing unauthorized computer equipment is in fact illegal. Legislation makes it mandatory to recycle computers through the government approved facilities. Recycling a computer can be made easier by taking out certain reusable parts. For example, the RAM, DVD drive, the graphics card, hard drive or SSD, and other similar removable parts can be reused. The central processing unit contains many toxic materials. It contains lead and chromium in the metal plates. Resistors, semi-conductors, infrared detectors, stabilizers, cables, and wires contain cadmium. The circuit boards in a computer contain mercury, and chromium. When these types of materials, and chemicals are disposed improperly will become hazardous for the environment. According to the United States Environmental Protection Agency only around 15% of the e-waste actually is recycled. When e-waste byproducts leach into ground water, are burned, or get mishandled during recycling, it causes harm. Health problems associated with such toxins include impaired mental development, cancer, and damage to the lungs, liver, and kidneys. That's why even wires have to be recycled. Different companies have different techniques to recycle a wire. The most popular one is the grinder that separates the copper wires from the plastic/rubber casing. When the processes is done there are two different piles left; one containing the copper powder, and the other containing plastic/rubber pieces. Computer monitors, mice, and keyboards all have a similar way of being recycled. For example, first each of the parts are taken apart then all of the inner parts get separated and placed into its own bin. Recycling a computer is made easier by a few of the national services, such as Dell and Apple. Both companies will take back the computer of their make or any other make. Otherwise a computer can be donated to Computer Aid International which is an organization that recycles and refurbishes old computers for hospitals, schools, universities, etc. ^ "Parts of computer". Microsoft. Archived from the original on 27 November 2013. Retrieved 5 December 2013. ^ von Neumann, John (1945). "First Draft of a Report on the EDVAC" (PDF). Archived (PDF) from the original on 9 August 2013. ^ Markgraf, Joey D. (2007). "The Von Neumann bottleneck". Archived from the original on 9 June 2011. Retrieved 24 August 2011. ^ "How long should a laptop battery last?". Computer Hope. Archived from the original on 21 December 2013. Retrieved 9 December 2013. ^ Domingo, Joel. "SSD vs. HDD: What's the Difference?". PCMag. Archived from the original on 19 March 2017. Retrieved 24 March 2017. ^ Edwards, Benj (17 January 2012). "Evolution of the Solid-State Drive". PCWorld. Archived from the original on 25 March 2017. Retrieved 24 March 2017. ^ "US B2B Channel sales reach nearly $62 Billion in 2013, According to The NPD Group". NPD Group. 4 February 2014. Archived from the original on 8 August 2014. ^ "How to recycle your old computer". Digital Trends. 18 December 2016. Archived from the original on 17 April 2017. Retrieved 18 April 2017. ^ Inc, Chris Keenan - Newtech Recycling. "Newtech Recycling Specializes in Computer Disposal, Laptop Disposal, Desktop Disposal Mainframe Disposal and Server Disposal". www.newtechrecycling.com. Archived from the original on 29 March 2017. Retrieved 18 April 2017. ^ "The Toxic Components of Computers and Monitors". Archived from the original on 27 April 2017. Retrieved 26 April 2017. ^ "What's Going On with Electronic Waste? – Electronics TakeBack Coalition". Archived from the original on 27 April 2017. Retrieved 26 April 2017. ^ "Wire Recycling". All-Recycling-Facts.com. Archived from the original on 10 July 2017. Retrieved 5 May 2017. ^ "Computer equipment recycling – Essential Guide". ComputerWeekly. Archived from the original on 21 December 2016. Retrieved 8 May 2017. ^ Schofield, Jack (19 February 2015). "How can I safely recycle my old PCs?". The Guardian. ISSN 0261-3077. Archived from the original on 27 April 2017. Retrieved 26 April 2017. This page was last edited on 5 April 2019, at 17:48 (UTC).